Whether you’re an interior designer, or a business owner selling products for the kitchen and bathroom, the Kitchen and Bath Industry Show is a must attend event! As North America’s largest event dedicated to kitchen and bath, it is the ultimate opportunity for marketing, networking, and learning to expand your business. 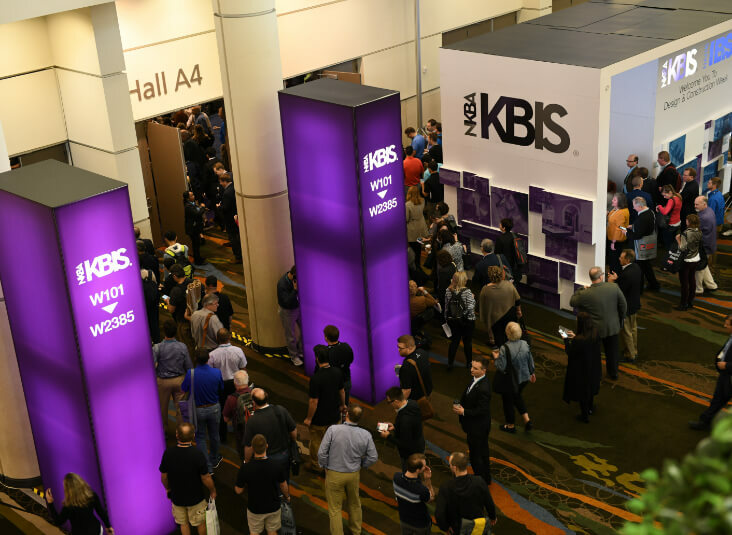 Here are the top 10 reasons you can’t miss out on KBIS 2019. Learn how to hone your business techniques with a wide variety of training seminars at the Voices from the Industry Conference. With presentations on growing your business, training new employees, marketing, design, and customer service, you’re sure to come out with many improved business strategies in mind. Stay on top of the latest trends in appliances, hardware, flooring, and more! With a showcase of over 600 exhibitors, you’ll have access to all the new in-trend products on the market for this coming year. Products change every year as technology grows rapidly to meet the needs of smart home capabilities and greener lifestyles. KBIS is the perfect place to get the inside scoop on all the latest innovations. Get your hands on everything the business has to offer. With everything all in one place, it is easy to compare which products work best for your business. Meet face-to-face with all of the major manufacturers and suppliers, creating contacts and creating new networking opportunities. With over 36% of attendees visiting for the first time, KBIS is an outstanding opportunity for reaching new clients. Exhibiting in the showcase will help to get and keep your brand in the mind of the market. Maintain and hone your image with the best new products you have to offer. With thousands of attendees all looking for the latest and greatest, you don’t want to miss out on the opportunity to earn their business! Get to know your competitors, compare products and innovations. Meet face-to-face and make contacts with hundreds of potential clients. Product exhibitions will be chosen to win from one of four categories, six for the Innovative Showroom Award for having unique and interactive showroom designs, and six for the Best Booth Award for creative and interactive booth designs. This year KBIS will be held February 19-21 at the Las Vegas Convention Center. The show floor hours will be 9am-5pm each day. Don’t forget to stop by and see the latest products we have to offer this year at MR Direct, Booth N3226! We can’t wait to see you in Las Vegas!